LOS ANGELES, March 4, 2014 /PRNewswire/ -- OPI Products Inc., a subsidiary of COTY Inc., and Ford Motor Company today announced a unique collaboration featuring the iconic Ford Mustang. 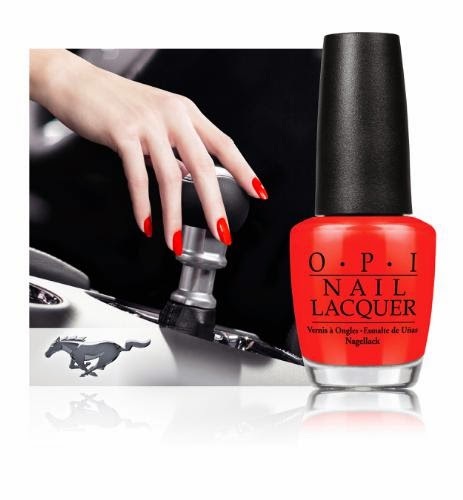 The popular pony car – celebrating its 50th anniversary in April – will serve as the inspiration for a line of OPI limited edition nail lacquers that will launch internationally in July. "OPI is thrilled to partner with one of the world's top automotive companies in celebrating 50 years of Ford Mustang," said Suzi Weiss-Fischmann, OPI Co-Founder and Executive Vice President. "For women, cars and nail lacquer offer a way to express personality. This new collection will deliver elements of sophistication, luxury, power and style fitting for both OPI and Mustang consumers." The collection's hero shade, Race Red, is a tribute to one of Mustang's most iconic colors. "Ford Mustang inspires passion like no other car, and we are excited to be working with OPI on an exclusive collection that captures the spirit of our iconic car," says Melanie Banker, Mustang marketing manager. "There is no better way to express Mustang's bold personality and the excitement it creates than through color." Celebrating an IconThe Ford Mustang is about to become the newest member of a very exclusive club – vehicles in continuous production for 50 years. Over the last five decades, Mustang has gained worldwide popularity and has become an enduring part of pop culture with more than 9.2 million Ford Mustangs sold and roughly 3,000 appearances on film and TV – including its upcoming big screen appearance as the hero car in "Need for Speed." Mustang's unique combination of style, performance and affordability established an entirely new class of sporty cars, and its next chapter unfolds with the all-new Ford Mustang. Its most advanced version yet, the 2015 Mustang features an all-new sophisticated design – clearly inspired by its 50-year heritage – and a host of new innovative technologies and connectivity systems. About OPIAs the world leader in the professional nail care industry, OPI is committed to providing high-quality products and services to both salons and their customers, along with a focus on industry safety and innovation. Known for its exceptional formula, fashionable colors and iconic names, OPI's heavily-pigmented lacquers are super rich, long-lasting and chip-resistant – offering an affordable luxury to consumers. Currently, OPI is available in over 100 countries and offers a full line of professional items, including nail treatments, finishing products, lotions, manicure/pedicure products, files, tools and acrylics. In addition, OPI offers more than 100 GelColor shades. OPI is a subsidiary of COTY Inc (NYSE: COTY). Coty is a leading global beauty company with net revenues of$4.6 billion for the fiscal year ended June 30, 2013. For more information, visit OPI at www.opi.com. Follow OPI on Twitter @OPI_Products or become a fan at Facebook.com/OPIproducts. About Ford Motor CompanyFord Motor Company, a global automotive industry leader based in Dearborn, Mich., manufactures or distributes automobiles across six continents. With about 181,000 employees and 65 plants worldwide, the company's automotive brands include Ford and Lincoln. The company provides financial services through Ford Motor Credit Company. For more information regarding Ford and its products worldwide, please visit http://corporate.ford.com.